A new community opera created in partnership with Wolverhampton Grand Theatre, Wolverhampton Music Education Hub and many local groups and schools from Wolverhampton. 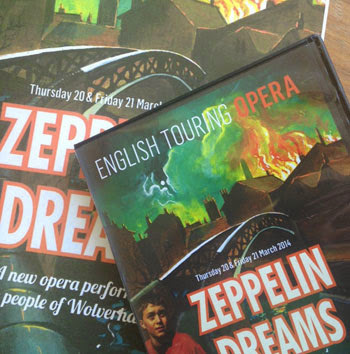 In 2013-14 English Touring Opera was delighted to return to Wolverhampton and the Wolverhampton Grand Theatre for Zeppelin Dreams, a brand new full-length opera created especially for the city. The piece explored the tragic events of 100 years ago, when the largest airship ever built, a famous Graf Zeppelin, lost in the fog and bound for the docks in Liverpool, dropped its bombs on Wolverhampton. The opera bound the present with the past, and was performed by 250 local people and ETO professionals. This new community opera was a partnership with Wolverhampton Grand Theatre and Wolverhampton Music Education Hub. It built on the success of A House on the Moon, the community opera created with Wolverhampton Grand Theatre in 2007. For Zeppelin Dreams 12 separate groups of different ages, skills and abilities took part in a series of over 100 creative workshops that led to the three final performances at the end of March 2014. East Park and Uplands Primary Schools, two groups from Aldersley High School, Wolverhampton University, Penn Hall Special School, Azaad Dhol percussion ensemble, The Music Education Hub Orchestra, the Discoverers and WOW theatre companies, a recruited adult group, and the GET-IN theatre group made up the company. Players from the Royal Academy of Music, and three professional singers (Joseph Shovelton, Casey-Joe Rumens and Austine Broad) led the cast. We were supported by many local organisations and historians. Rachel Leach was the composer, Tim Yealland the writer/director, and Alan and Jude Munden the designers. I have been going to professional productions for many years and I have to say that this “community opera” is one of the best shows I’ve ever witnessed and if you missed it then you missed a real treat. It tells the true story of the night a First World War German Zeppelin bomber dropped its bombs in the Black Country, 31st January 1916. It was a story that I previously knew nothing about and I feel all the richer now for knowing it. The story was researched for over two years and was handled in such a moving way that you couldn’t help to feel the emotion in the theatre. However, the most incredible thing about the show was that almost all of the performers were members of local community groups. The talent that this area has hidden in its secret pockets is awe-inspiring and I am really pleased that some of those talented individuals had a chance to shine last night. The coordination and rehearsing of all these groups must have been a logistical nightmare but when it all came together on stage it was a very powerful piece and showed not only the wealth of talent in the Black Country but also the inclusive natures of ETO and the Grand Theatre. In real life there are people with disabilities; people in wheelchairs; those unable to communicate in fluent ways and some of those people were represented here and took an important role in this production. It made me feel proud to be brought up in the Black Country and proud that this wonderful theatre encourages local community groups to get involved in the arts. I hope that ETO returns to Wolverhampton again soon with a similar project and that the few spare seats that I saw last night get filled up with Black Country folk keen to support the arts and their own heritage. We are grateful to Youth Music, the J Paul Getty Jnr Charitable Trust, the Heritage Lottery Fund and others who funded project. If you want to recapture the magic of Zeppelin Dreams, or if you missed it completely, you can watch it in full at home with the full-length film produced by Primo. The cost is £8.20 (including £2.50 postage and packaging), and comes with a 96-page, A4-sized souvenir book of glossy, high quality pictures from the opera and rehearsal process. The DVD and book will also be available to buy separately through participant schools, and at an official launch event at Wolverhampton Grand Theatre on Monday 15 September. Click the button below to buy from PayPal. On 12 July we are delighted that Uplands and East Park Primary schools will be performing excerpts from the show as part of the Wolverhampton City Show at West Park. On 15 September the full performance will be screened at Wolverhampton Grand Theatre at 6.30pm. For more information about these events, contact Louise Bent at the Grand: louise@grandtheatre.co.uk. Zeppelin Dreams was an amazing show and a brilliant show. We saw it tonight 20th march and our granddaughter was taking part in it from Penn Hall School. I am full of admiration for the people who bought this together and for all the groups who took part. Well done to all. A really wonderful community effort, brought together by the English Touring Opera! It's just a shame that there were only 3 performances; it certainly deserves a wider audience. Thank you everyone for all of your dedication and hard work!